New jewelry designs by Hileman Jewelry in sterling silver and 14k gold. Jewelry features inlaid Australian opal, dinosaur bone, turquoise, lapis, sugilite and other stones accented by black diamonds, sapphires, topaz and garnets. Bold black onyx and lab opal ring in sterling silver by Hileman Silver Jewelry. 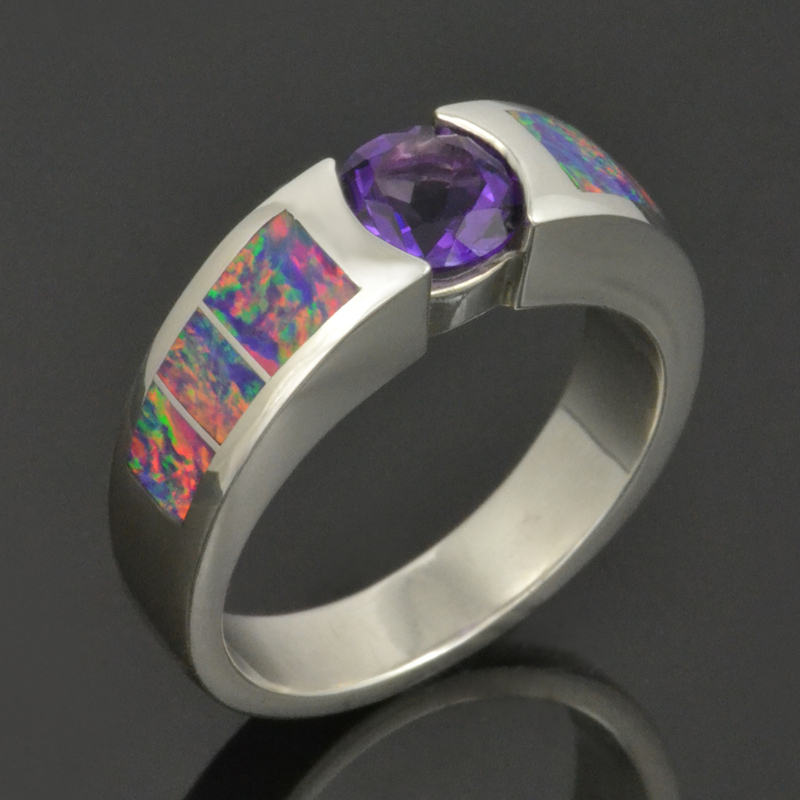 We just added this handsome new man’s lab opal ring to our men’s ring line. 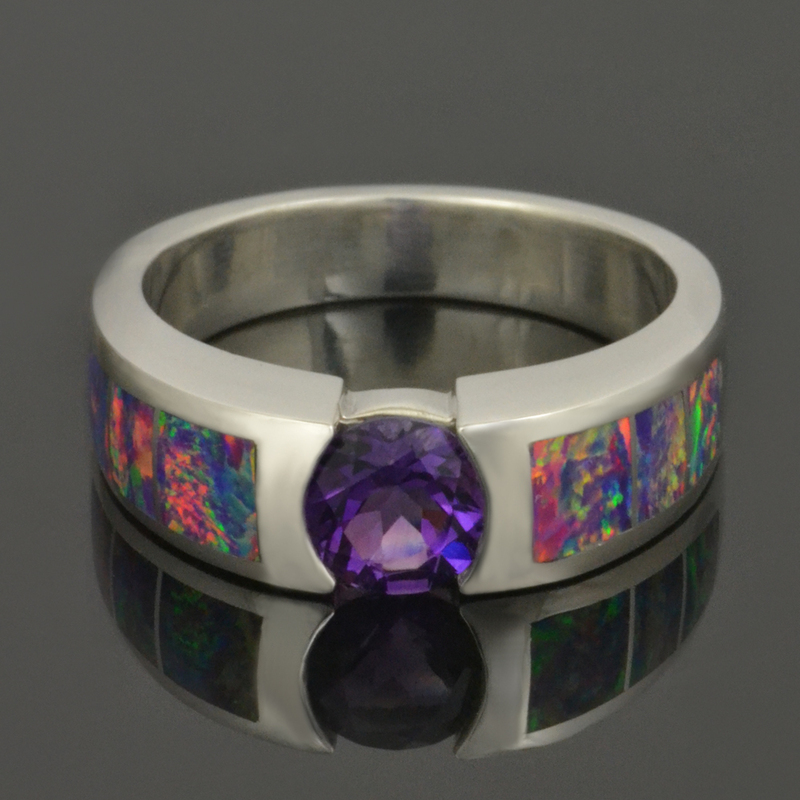 The ring features four pieces of black onyx and a center piece of lab created opal precisely inlaid in sterling silver. The lab opal fires blues and greens with flashes of orange from some angles. This ring design is fairly wide, measuring about 10mm wide at the top with a slight taper toward the bottom. The ring has a nice weight and is designed to allow the silver to be refinished many times if needed. The metal is sterling silver but the ring can be custom made in white or yellow gold, 316L stainless steel or platinum for an additional charge. Because all of our rings are made to order in your specific ring size, you also have the option to make changes to the inlay stones used, the inlay pattern or the metal used. We have other opal color choices available for the lab opal center stone or other stone choices if lab opal is not for you. Your new ring will take 4 to 6 weeks to create so please plan ahead if you have a specific date for delivery. This bold ring is now available at HilemanSilverJewelry.com so head over and take a closer look at this stunning new design. This new lab created opal wedding ring set is stunning. We inlaid the wedding set with some of the new lab opal we just received. This new lab opal has bright green flashes of color on a dark blue base color. The colors and flash of the lab opal mimic those of the best Lightning Ridge Australian opal at a much more affordable price. 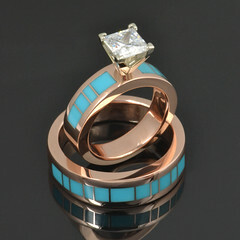 Both rings in the set are a comfortable thickness and width. The man’s band is 6.5mm wide at the top and the woman’s band is slightly narrower at 5.5mm wide. Both the man’s wedding ring and the woman’s are available for purchase separately if you don’t need a set. You can also purchase the set in hers and hers or his and his combinations. The green lab opal in these rings is very flashy and bold. We also have several other lab opal color options that are variations of blue-green and some options that are multicolor. Green lab created opal wedding ring set in sterling silver by Hileman Silver Jewelry. in lab created opal. The resin gives the synthetic opal more durability and helps to resist cracking. Laboratory grown opal gives you all the fire and colors of top grade natural opal at a much more affordable price with increased durability. His and hers lab created opal wedding ring set. This set is available for purchase in our Hileman Etsy shop or our new Lab Opal Jewelry website. Please allow us 4 to 6 weeks to make your rings in your exact sizes. See more lab opal colors on our Hileman Flickr page or on our lab opal Pinterest board. If you are interested in natural Australian opal take a look at our Australian opal jewelry website featuring only the finest Australian opal inlaid in our bold 14 karat gold designs. 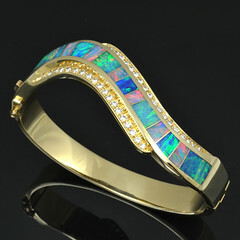 We are excited to offer some great new lab created opal in beautiful colors and patterns. This is the first ring completed with the new multicolor laboratory grown opal. This opal fires in red, orange and yellow with a purple base color and hints of blue and green. We took special care to cut the lab opal to mimic the random pattern and colors of natural Australian opal. The colors in the lab opal look great with the purple amethyst set in the center. This ring would make a fun statement ring to complete your ensemble for a night out or it could be the unique wedding ring you have been searching for. The ring is shown in sterling silver but is also available in gold or platinum for an additional charge. 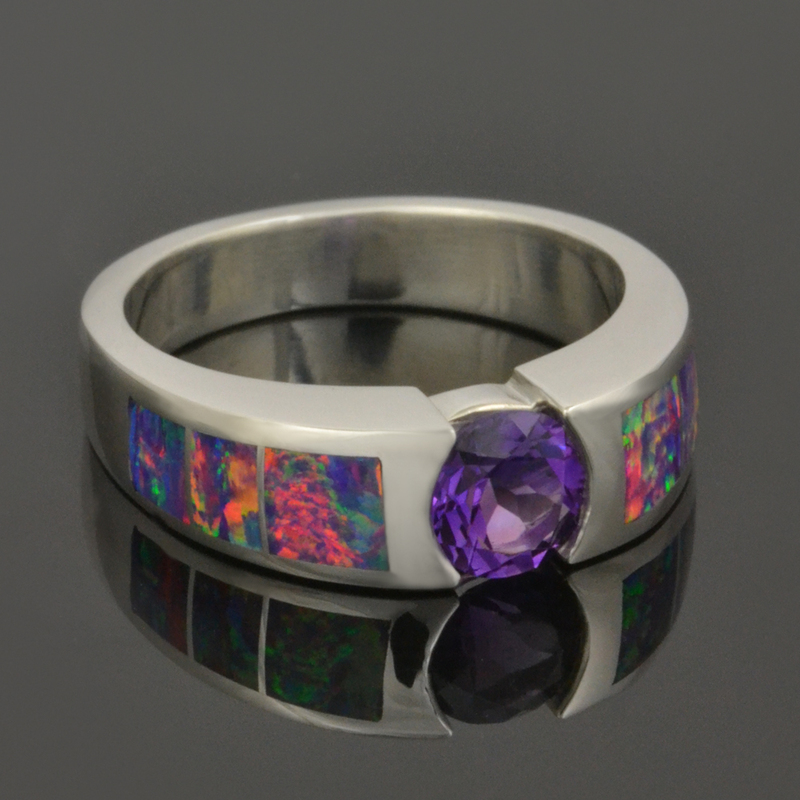 The stunning lab created opal in this woman’s amethyst ring is a top quality synthetic opal grown under laboratory conditions. The manmade opal’s chemical composition is the same as natural opal with the exception of water content. Australian opal contains about 4% water and lab created opal contains no water. Instead, the water is replaced with resin. The resin gives the synthetic opal more durability and helps to resist cracking. Laboratory grown opal gives you all the fire and colors of top grade natural opal at a much more affordable price with increased durability. Stop by our new Lab Opal Jewelry website or our Etsy shop to read more about it and see our other jewelry items available. Keep checking back to our blog and our Facebook page to see updates on the latest jewelry created with the new lab created opal colors. New Chrysoprase Wedding Ring Set! Chrysoprase wedding ring set with pave` set white sapphire in sterling silver. 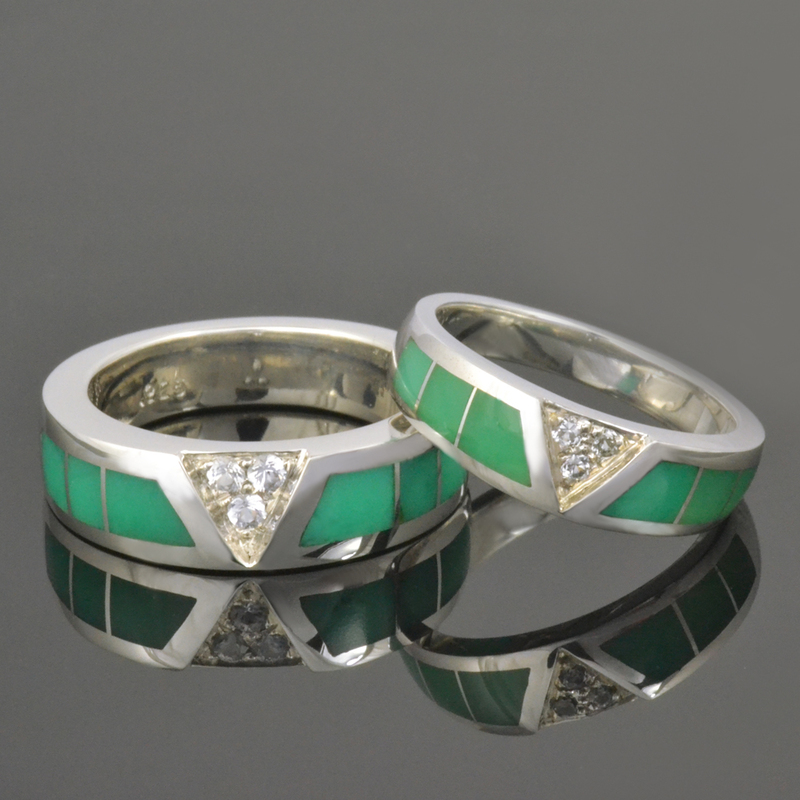 We recently completed this stunning new chrysoprase wedding ring set. This unique chrysoprase wedding set is inlaid with three pieces of chrysoprase on each side of three sparkling white sapphires. The white sapphires are pave` set in a triangle cluster and at first glance appear to be one bigger trillion cut stone. The total weight of the white sapphires in his ring is .12 carats and her ring is .09 carats. This set is shown in sterling silver but the set is also available in 14 karat gold or platinum for an additional charge. For those not familiar with chrysoprase, it is a rare form of chalcedony or quartz. Chrysoprase ranges from light to dark green but is most sought after in its striking apple green color. Chrysoprase is rare due to the fact that it is cryptocrystalline. This means that instead of being formed by large six sided crystals, the size of the crystals are extremely small and cannot be seen as distinct particles under normal magnification. Chrysoprase has a hardness of 6.5 to 7 on the Moh’s scale and is in the same stone family as agate, carnelian, and onyx. Because chrysoprase is so hard, it is highly suitable for inlay and will stand up to daily wear and tear in a wedding ring. The best known sources of chrysoprase are Queensland Australia, Germany, Poland, Russia, Arizona, California, and Brazil. The chrysoprase in this wedding ring set is from Australia. This his and hers matching ring set will be made to order in your ring sizes in 4 to 6 weeks. All of our jewelry is handmade by the Hileman family in our Arizona studio. This set may also be customized by changing the inlay from chrysoprase to dinosaur bone, turquoise, opal or any of the other stones you see on our website. Black diamonds, blue sapphires, moissanite or diamonds could be substituted for the white sapphires as well. Some modifications will be upgrades and additional costs will apply. This style wedding set is also available in his and his or hers and hers ring set combinations. 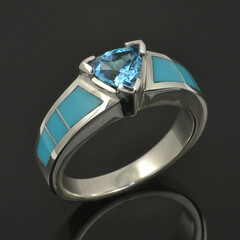 Check out the listing for this beautiful ring set on Etsy or browse our wedding ring sets on HilemanSilverJewelry.com. Don’t forget to follow us on Facebook and Twitter for updates on new designs and promotions. Cobalt chrome is one of newest alternative metals to hit the jewelry market. Cobalt chrome is the perfect combination of color, strength and weight for a wedding ring. It’s color is very white and is comparable to that of platinum at a much more affordable price. Cobalt chrome is very strong but at the same time malleable enough to be practical for most jewelry styles. It won’t shatter or crack like some of the other alternative metal choices. Cobalt chrome is 4 times harder than platinum, 5 times harder than gold and 7 times harder than silver. It has a nice weight, similar to that of white gold. Cobalt chrome rings are not featherweight like titanium and not super heavy like tungsten rings. The other advantages of cobalt chrome rings over titanium and tungsten rings are its pleasing white color and the ability to size the ring slightly if needed. We are excited to offer cobalt chrome as an upgraded metal choice for our wedding rings. It’s durability makes it a great choice for our wedding rings and sets. Because of the extreme hardness of this new metal, we will have to charge more for cobalt chrome rings than our sterling silver rings to cover the additional metal working time and extra wear and tear on our tools and equipment. Tan dinosaur bone ring in cobalt chrome. 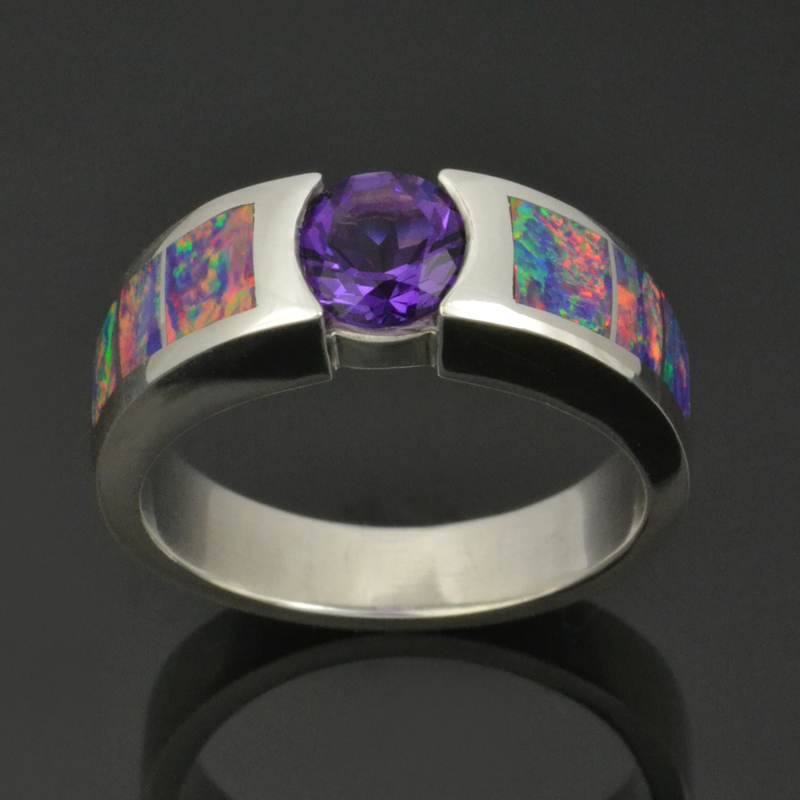 Here is one of our first rings made in cobalt chrome. 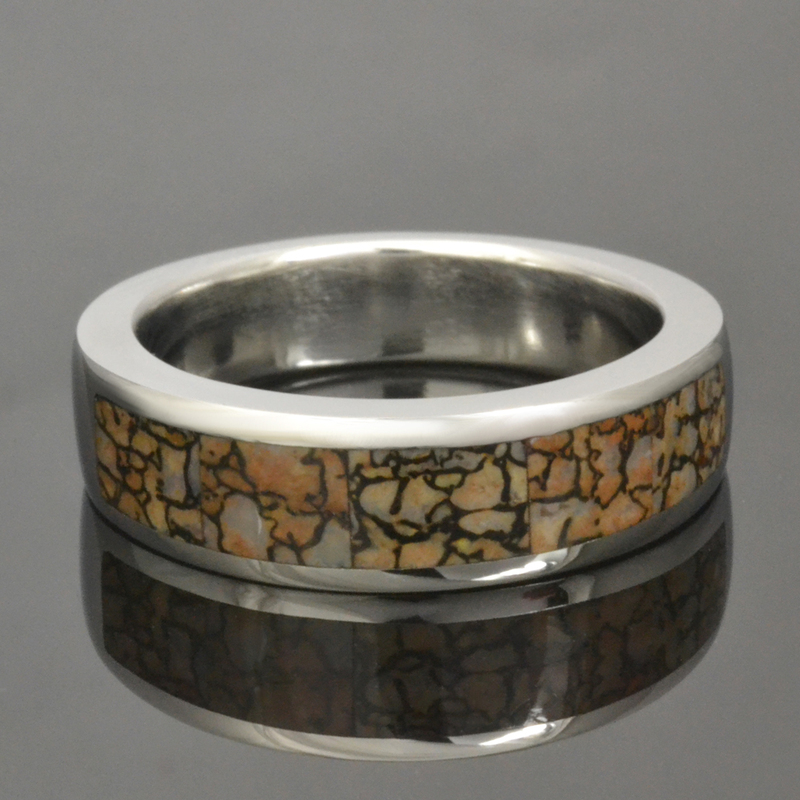 The ring is inlaid with tan dinosaur bone with no dividers between the sections of dinosaur bone, giving it the appearance of one continuous piece of dinosaur bone across the top of the ring. As you can see, the cobalt chrome has a nice bright white color similar to platinum or rhodium plated white gold. To see more photos of this dinosaur bone ring in cobalt chrome visit our Etsy shop at Etsy.com/shop/thehilemancollection. Most of our ring designs will be available in this great new metal choice. Please contact us for details or questions. New Pink Dinosaur Bone Ring! 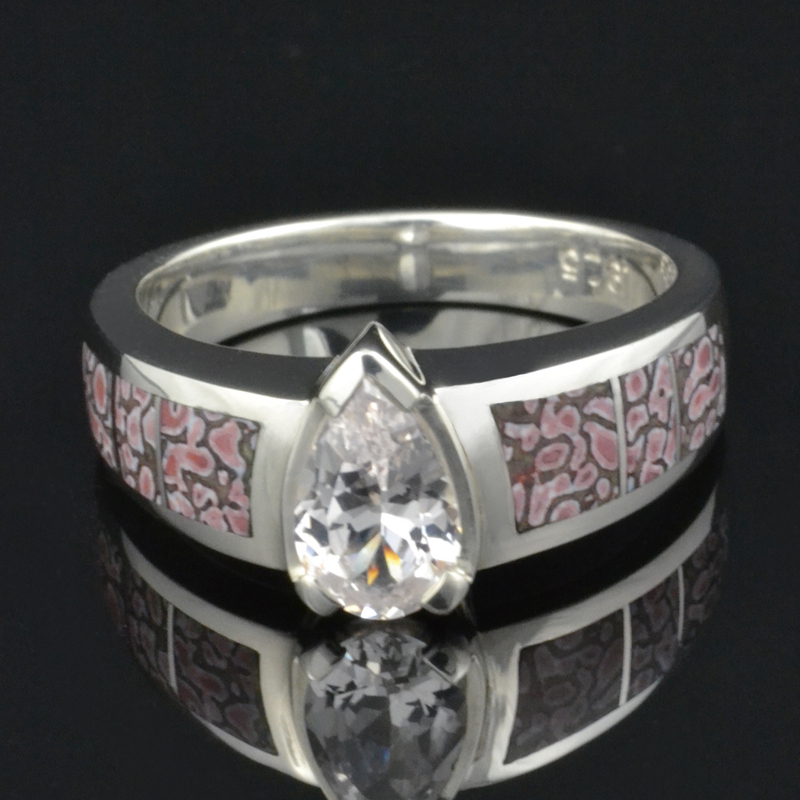 Pink dinosaur bone ring with white sapphire center stone by Hileman Silver Jewelry. We just completed our first ring with some of the pink dinosaur bone we acquired a few months back. This dinosaur bone is a little more subtle than the red or the gray in some of our other dinosaur bone ring designs. The new pink dinosaur bone has more pastel pink with some darker mauve spots all surrounded by brownish gray cell walls. The softer colors give this woman’s ring a more feminine feel and don’t overpower the center stone. This ring would make a nice alternative wedding ring or engagement ring for someone looking for a unique alternative to a diamond band. We can create a matching 4.5mm dinosaur bone wedding band to complete the matching bridal ring set. 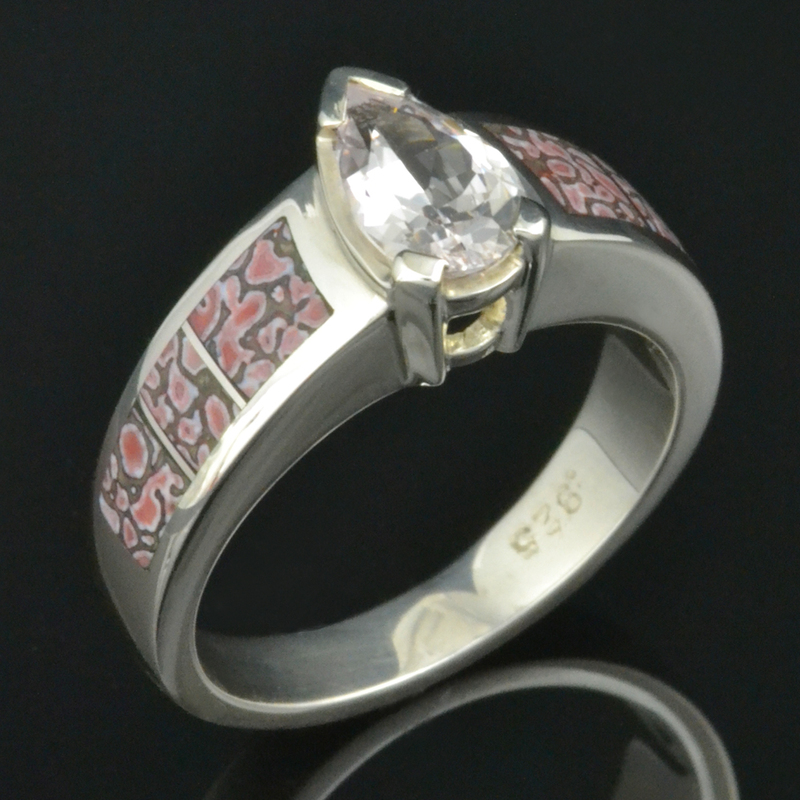 We can also inlay this new pink dinosaur bone into any of our other ring or jewelry designs by special order. See the video of this ring on YouTube! Pink dinosaur bone ring with white sapphire in sterling silver. The pink dinosaur bone in this ring came from the Morrison Formation in Utah and was a living animal during the Jurassic Period around 144 to 208 million years ago. It is actually no longer bone material but is a combination of minerals that replaced the bone over time. Dinosaur bone is found in a rainbow of colors with the webbing color and cell size varying greatly from piece to piece. The varying cell size and colors create some truly unique patterns and virtually one of a kind pieces of jewelry. Fossilized dinosaur bone can be composed of many different minerals including agate, jasper and calcite. The color of the dinosaur bone is determined by the combination of minerals present when the fossilized bone formed. You can see this new dinosaur bone ring and others in our Etsy shop or on www.HilemanSilverJewelry.com. Don’t forget to follow us on Facebook and Twitter for updates on new items, sales and promotions!